Zeek was a simple-minded freak that was recruited by a group of criminals who took advantage of his innocent nature. They tricked him into thinking of them as his friends and that Dragon was out to hurt them. Zeek fought Dragon as he attempted to apprehend them over the abduction of Peter Klaptin. Alex Wilde talked Zeek out of finishing off a badly injured Dragon and the muscle-bound man simply wandered off. When Dragon was recruiting for the Special Operations Strikeforce, he considered this strong young man for membership but could not locate him. He was eventually tracked down and joined the government team during its second wave of recruitments. 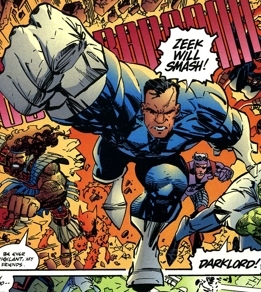 Zeek instantly proved himself a worthy addition, singlehandedly bringing down several threats that would have otherwise endangered the lives of his newfound friends. The God Squad launched their mission to transport all of offspring of the Gods to the planet of Godworld. They raided the headquarters of the S.O.S. to abduct three of their members. After two members were taken, it was clear that Zeek was the other target but the sight of his friends apparently being killed set the hero off into a rage. Zeek brutally decimated the ranks of the God Squad. This enabled a rescue mission to Godworld to occur that saw the other captured godlings returned to Earth. Zeek remained amongst the S.O.S. for another couple of years but when CyberFace came to power, many things changed throughout the world. The Gods set up a new home in the Hidden City of God Town. Zeek went to live there and was amongst a whole city of people that respected and cared for him. It was only after the Gods rescinded their vow of non-interference with mortals that Zeek began to visit the mortal world again. After returning to Chicago, Zeek stumbled across the Rock House Diner and ate a huge amount of food without paying. He left and did not even understand that he was supposed to have paid for his meal. Rock attacked Zeek over this and refused to allow him to depart. Widow halted the battle and Zeek apologized, agreeing to pay off his debt by working cleaning dishes. This newfound friendship led to Zeek defending the Rock House Diner against a contingent of Vicious Circle thugs led by Buster Justice and included Joey Finkleberry. These two powerhouses finally came to blows with Zeek winning thanks to the assistance of the heroine Lethal. Zeek is later seen fighting alongside Rock and his crew aganist the Abosrbanoids attack on earth as well as the Tyrrus Combine’s attack on Earth. Sometime later after Zeek leaves Rock’s diner, he is ambushed by Absorbing Junior who tries to steal Zeek’s powers. However, Zeek quickly recovers and crushes Absorbing Junior’s head into a bloody mess. Immediately after the fight, Atlas shows up declaring that he is taking Zeek back to God Town. Zeek defies Atlas and a battle commences. However, after a long brutal fight, Zeek sees the benefits of going back to God Town. He agrees, and the pair then head to God Town.